There are fears that the future of traditional Cornish male voice choirs could be under threat because of the ageing membership. Many choir members are pensioners and organisers say it is hard persuading younger people to join up. Ron Brown from the Four Lanes choir said young people seem to be playing instruments but they do not want to use their voices. 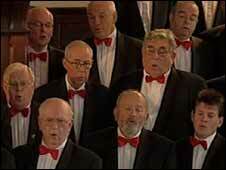 Other enthusiasts said choirs are a key part of Cornwall's heritage. Mr Brown said: "It's very difficult to get youngsters to join in. In the 'band' world youngsters seems to be playing instruments but they don't want to use their voices." Kingsley Hitchins, also from Four Lanes, said: "I'm very concerned that if youngsters don't come forward then male voice choir singing will die, which would be a great shame." The Four Lanes Choir, based in the Cornish village of the same name, started when a group of villagers decided to stage a concert to welcome home soldiers from World War Two. Its first performance was in a church hall shrouded in black-out curtains, and its first conductor was a local butcher. The choir's membership has now grown to 75 and it performs around the world, but the average age of its members is over 60. Its motto is: "Sing we for pleasure, for one and all". The Cornish Federation of Male Voice Choirs represents 27 choirs and celebrates its silver jubilee this year. Its spokesman Jim Christophers said: "Male voice choir singing is a significant and integral part of the Cornish culture and heritage. "While it is perceived by some to be an older man's hobby, the physical and psychological health benefits of choir singing for all are well documented."